There are two parts to the FacilityDude Safety Center application: the Administrator Portal and the Mobile App. Only users that write or publish plans will need access to the Administrator Portal. All other users will simply download the published plans to their smartphones using the Safety Center mobile app. If you select the Authorized User List security option for your plan, you will need to create a separate login for the mobile app in addition to the login for the admin portal. This only applies to plans with an Authorized User List. You can use the same login information for both accounts. The login screen for the Safety Center Administrator Portal is completely separate from the login for the rest of your FacilityDude applications. For security purposes, the password requirements are also more stringent, so you will need to create a new password to use for this application. support@facilitydude.com with the subject line: FacilityDude Safety Center - Set Up Password. Between 8 and 40 characters in length. Have at least one Uppercase character. Have at least one Lowercase character. Have at least one Other character. Click Reset Password. You will be taken to the Safety Center home page. Go to safetycenter.facilitydude.com. You can bookmark this page or create a shortcut on your desktop to make it easy to come back to this page later. Waiting for Approval - In this section, you will see any plans that are waiting to be published. Recently Updated Plans - This section will show you the last 5 plans that have been updated. You can click on the Open button to go into those plans. Click View Details to see more information about these messages. Click Send New Message to create a new push notification. 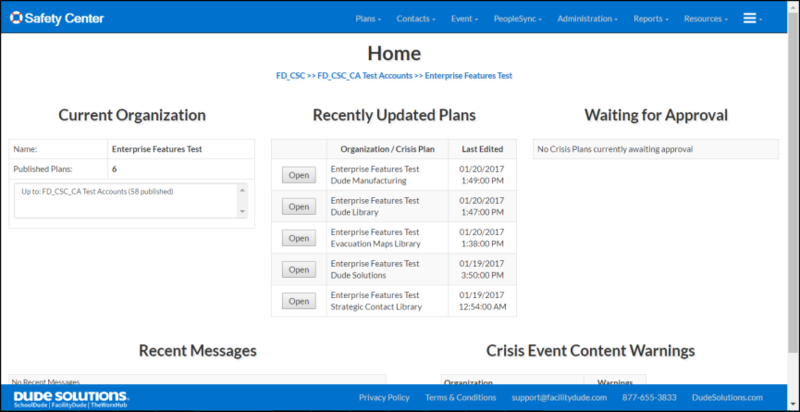 Crisis Event Content Warnings - This section allows you to view warnings regarding links within your plan(s). If a plan has a link that is HTTP instead of HTTPS, it will show in this section. *Note: All links need to be in HTTPS format to comply with Apple Transport Security Requirements. The tabs at the top of the screen take you through the process of entering the information into your plans that will be seen by your end users.